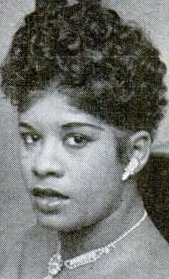 Ruth Brown was probably the second most popular female R&B singer of the early and mid 1950s (right behind Dinah Washington). Her magnificent voice could "sell" a song (sometimes in spite of the song itself), and, with the greatest number of singles issued by a female singer on the Atlantic label, she made trip after trip to the R&B charts. In fact, Atlantic Records was sometimes referred to as "The House That Ruth Built." Ruth Weston was born in Portsmouth, Virginia in 1928. Since her father, a Methodist clergyman, directed the church choir, it's no surprise that Ruth grew up influenced by church music. In spite of this, she found herself drawn to secular music, revering Billie Holiday and Ella Fitzgerald. Practicing popular music proved a challenge, since her father forbade it in the house. But practice she did, and ended up singing at local USO clubs during World War 2 (she could get away with this because her father worked nights at a shipyard). While her mother eventually reconciled herself to Ruth's music, her father, sadly, never did. Some servicemen chipped in to send Ruth to New York to compete in the famed Wednesday night amateur show at the Apollo Theater. While Ruth was terrified to be on the big stage in front of one of the toughest audiences in the world, she walked away with first prize (the unbelievable sum of $15). In the mid-40s, still a teenager, she met and married trumpeter/vocalist Jimmy Brown. They appeared together singing duets as "Brown & Brown," although after a while, Jimmy Brown seems to have disappeared for a time. Initially Ruth started out copying her idol Billie Holiday. We're not talking about basing her act on Holiday's, but actually copying it, note for note and gesture for gesture. One night, Billie herself caught the act and was not amused. After ranting and raving for a while, she finally calmed down and told (possibly ordered) Ruth to be herself. In 1948, she was working at the Frolic Show Bar in Detroit when she was heard by bandleader Lucky Millinder. He hired her as his vocalist, but Ruth only sang with them on a single occasion (after travelling with them and rehearsing for three weeks). They were playing Turner's Arena (in Washington, D.C.), and, when she came off the stage, she went and got some sodas for some of the band. Millinder flew off the handle. Claiming that he was paying her to sing, not be a waitress, he fired her on the spot, refusing to give her any back pay. Ruth was broke and couldn't afford to get back home. Fortunately the Crystal Caverns were only a few blocks away. 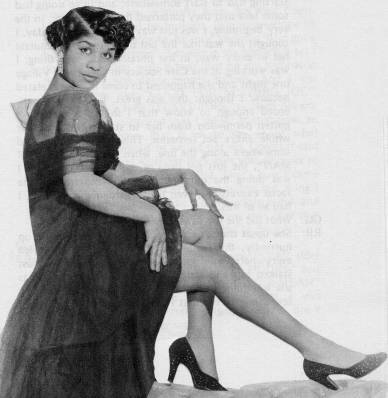 The manager of the club, Blanche Calloway (sister of bandleader Cab Calloway), gave her a chance to perform (a week's employment for $35, enough to catch a bus home to Portsmouth). When she became an instant success with the crowds, Blanche not only held her over, but became her manager. While singing at the Crystal Caverns, Ruth got her big break, although the stories of how it happened are all contradictory. The hero in the piece was local DJ Willis Conover, who heard Ruth and contacted the management of Atlantic Records. After that, it gets cloudy, one source has Atlantic's Ahmet Ertegun and Herb Abramson contacting Blanche Calloway in October 1948. Blanche convinced them to sign Ruth, although they hadn't heard a note of her singing. Another version has Abramson coming down from New York and, being entranced with Ruth's performance, signing her on the spot. Yet a third version has both Abramson and Ertegun present. Jazz enthusiasts Ertegun and Abramson had started Atlantic Records in late 1947, and the fledgling label had had a couple of hits with Tiny Grimes' "Midnight Special" and Stick McGhee's "Drinkin' Wine Spo-Dee-O-Dee." However, at this point, Atlantic still lacked a "star." Ruth had to finish out her time at the Crystal Caverns, which had stretched from one week to sixteen. At this time, her husband, Jimmy Brown, resurfaced, never giving a convincing explanation of where he'd been. As a favor to Ruth, Blanche put Jimmy in the Crystal Caverns band. Both an Atlantic recording session and an appearance at the Apollo Theater were arranged in New York for November 1948, and they departed in late October. Blanche and Ruth had originally planned to take the train, but with Jimmy now around, they decided to drive. Tragically, in Pennsylvania, they were involved in a serious car accident, which hospitalized Ruth for months. Atlantic, which really had high hopes for Ruth, paid all her hospital bills. Finally, on May 25, 1949, she showed up for her first session, at the Apex Studios, although still on crutches. But what a session! Coincidentally, Eddie Condon's Orchestra was in the studio recording another project and stayed on to back up Ruth. 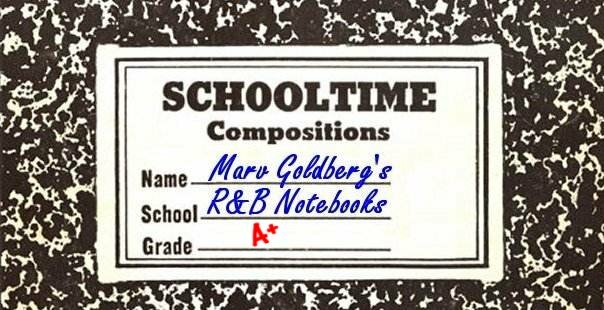 One of the songs from that session, SO LONG, was Ruth's first hit, reaching #4 on the R&B charts. 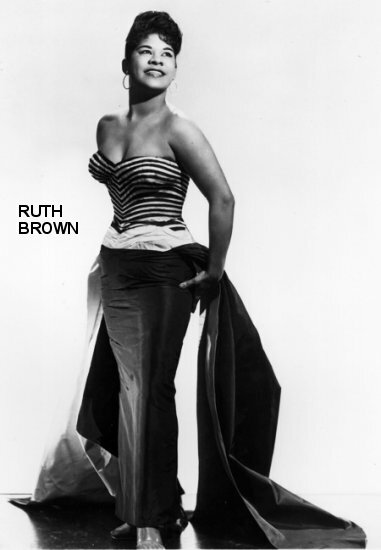 It wasn't her last, though; Ruth Brown would end up placing 24 of her Atlantic tunes on the R&B charts (6 of them also making the Pop charts). Jimmy Brown even had some recordings on his own for Atlantic (as Jimmy Earle): BIG RED BLUES and MY LOVE IS TRUE were issued in late 1949. Along the way, Atlantic acquired some masters by Brown & Brown. They had been recorded years earlier, and were never released by Atlantic at the time. One of these tunes that has subsequently seen the light of day is HEY PRETTY BABY, a blatant rip-off of CALDONIA. In a way, it's a shame this lively duet was never released at the time, since it's quite good. Ruth's next release, I'LL GET ALONG SOMEHOW, was a cover of the Larry Darnell's hit. It was originally issued as the singing part only (with ROCKING BLUES on the flip). However, in order to better compete with Darnell's version, it was reissued with Darnell's recitation on side 2. (The recitation, originated by performer Bobby Marshall, began "Yes, you're way up on top now, and you want to be free"). While Ruth was using the song in her stage act at the time, and in spite of the "tear in her voice" delivery, Darnell's version was such a monster hit that her cover didn't even chart. Next came HAPPINESS IS A THING CALLED JOE, which did nothing for Ruth's recording career. Then, in January 1950, she was brought into the studio to record four sides with the Delta Rhythm Boys: WHY, (I'LL COME BACK) SOMEDAY, SENTIMENTAL JOURNEY, and IT'S ALL IN YOUR MIND. The first two were coupled in a 1950 release, the others remained in the can until 1954. While pleasant, none of these was in the "chartbuster" category. The coupling was for recording purposes only, the two acts weren't sent on the road together. 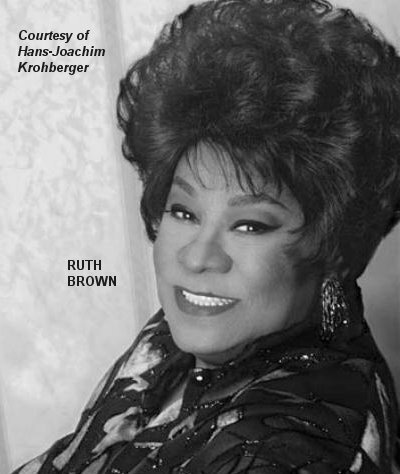 Two other Ruth Brown releases in 1950 also went nowhere: I CAN DREAM, CAN'T I and WHERE CAN I GO. 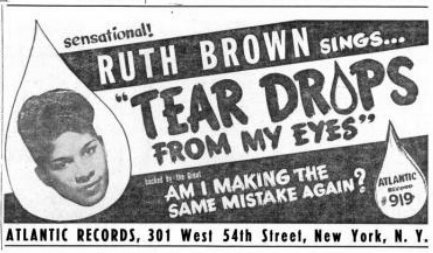 In fact, it was about a year until Ruth's second hit, 1950's TEARDROPS FROM MY EYES (written by Rudolph Toombs and backed by the Budd Johnson Orchestra), but it was worth the wait: this one zoomed right to the top, spending 25 weeks on the R&B charts in all, 11 of them at #1. In 1951, there were two chart hits: I'LL WAIT FOR YOU reached #3, followed a couple of months after that by Rudolph Toombs' I KNOW, which peaked at #7. This was the year that Pop singer Frankie Laine (known at the time as "Mr. Rhythm") dubbed Ruth "Miss Rhythm." The clinker in 1951 was the non-charting WITHOUT MY LOVE, backed with SHINE ON - BIG BRIGHT MOON, SHINE ON. In the spring of 1952, Ruth had her second #1 smash, 5-10-15 HOURS. As written by Rudy Toombs, the song was originally entitled 5-10-15 MINUTES, but Herb Abramson convinced Toombs that after the Dominoes' tremendous hit of SIXTY MINUTE MAN, mere minutes weren't enough; he changed the words. The sax work was done by Willis "Gator Tail" Jackson, with whom Ruth had taken up at that point (somewhere along the line she had divorced Jimmy Brown). Her other 1952 hit was DADDY DADDY, which rose to #3 in the fall of that year. The one that didn't make it to the charts was THREE LETTERS, which was the recitation from I'LL GET ALONG SOMEHOW. 1953 saw two more chart hits, starting with the monster (MAMA) HE TREATS YOUR DAUGHTER MEAN, another chart topper. This song was so big that it became Ruth's first crossover into the Pop charts (where it peaked at #23). The readers of Down Beat magazine voted that one their choice for the Number One R&B Record of 1953. Her other chart-buster that year was another kind of triumph: both sides of the record made the top ten -- WILD WILD YOUNG MEN (#3) and MEND YOUR WAYS (#7). MEND YOUR WAYS marked the first time that Atlantic had used overdubbing; in effect, Ruth is singing a duet with herself. Other 1953 releases were THE TEARS KEEP TUMBLING DOWN and LOVE CONTEST. 1954 opened with the release of SENTIMENTAL JOURNEY/IT'S ALL IN YOUR MIND, two tunes she'd done with the Delta Rhythm Boys back in 1950. Then there was HELLO LITTLE BOY, which also failed to chart. 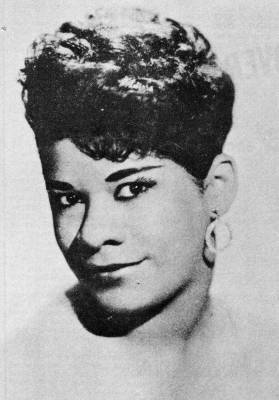 But then, in mid-1954, Ruth Brown soared back to the top of the charts with OH WHAT A DREAM, written for her by her friend, Chuck Willis (and the first Ruth Brown record to feature "her" backup group "Her Rhythmakers," who were usually Atlantic's ubiquitous Cues, but on this session they were actually the Drifters; both acts were managed by George Treadwell). It was followed, a couple of months later by MAMBO BABY, which also made it to #1 (riding the crest of 1954's Mambo Mania). Its flip, SOMEBODY TOUCHED ME, although popular (and another tune with the Drifters), wasn't a chart item. In a year and a half, Ruth had had a #1 hit, followed by a double-sided top ten release, followed by two #1 hits in a row. Atlantic had certainly found its star. 1955 opened with BYE BYE YOUNG MEN, which "only" rose to #13. This was followed by another 2-sided hit: AS LONG AS I'M MOVING (#4) and I CAN SEE EVERYBODY'S BABY (#7). Her next release, IT'S LOVE BABY (24 HOURS A DAY), also rose to #4 (and was covered by Hank Ballard & The Midnighters, who climbed to #10 with it). Then Atlantic decided to pair its #1 female star with Clyde McPhatter, whom (it was hoped) would be their #1 male star. The result was LOVE HAS JOINED US TOGETHER, which topped off at #8. [In my opinion, these two duets are more dull than interesting. Strange, because Ruth and Clyde were having an affair at the time, which culminated in the birth of Ruth's son, Ron.] Finally, there was I WANNA DO MORE (backed by an unusual female version of OLD MAN RIVER, the last of the four sides Ruth had done with the Drifters in 1954), which climbed to #3. In all, 1955 was a very good year for Miss Rhythm. After all this, though, there was only a single hit in 1956: SWEET BABY OF MINE, which just cracked the Top Ten (#10). I WANT TO BE LOVED and SMOOTH OPERATOR were chart misses in that year. In 1957, LUCKY LIPS, written by Leiber & Stoller, went to #6 R&B and #25 Pop (the Gale Storm cover only made it to #77). It was followed by WHEN I GET YOU BABY and I HOPE WE MEET (ON THE ROAD SOMEDAY), two more non-charters. 1958 saw A NEW LOVE/LOOK ME UP and BOOK OF LIES/JUST TOO MUCH, none of which charted. But in the fall, Atlantic released Ruth singing a Bobby Darin tune, THIS LITTLE GIRL'S GONE ROCKIN', which jumped to #7 R&B (#24 Pop). Its flip, WHY ME, reached #17 R&B. While these were big hits and got Ruth a lot of work, they weren't even close to the material she wanted to record, and she admits that her heart wasn't in them. There were two hits in 1959: JACK O'DIAMONDS (#23 R&B and #96 Pop) and Brook Benton's I DON'T KNOW (#5 and #64 respectively). There were also re-makes of MAMA, HE TREATS YOUR DAUGHTER MEAN (with no parentheses) and 5-10-15 HOURS, which went nowhere. Ruth's last Atlantic chart hit was DON'T DECEIVE ME, which reached #10 on the R&B charts in 1960 (#62 Pop). That year also saw THE DOOR IS STILL OPEN and TAKING CARE OF BUSINESS, which didn't chart. In 1961, Atlantic issued SURE 'NUFF and IT TEARS ME ALL TO PIECES, but it was all over. 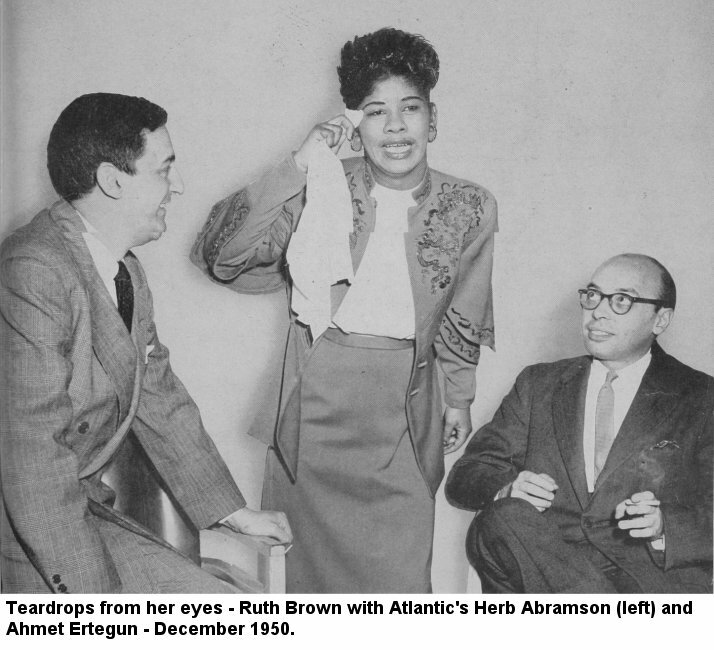 The music had changed and the relationship between Ruth Brown and Atlantic had changed. 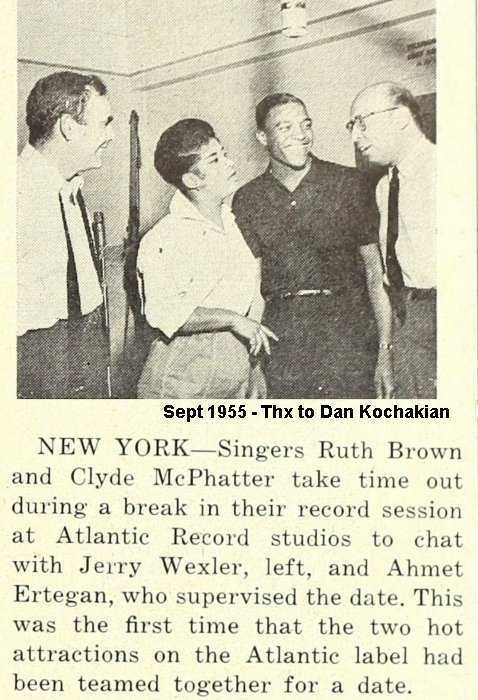 Ruth was instrumental in making Atlantic the success it became, yet there were few people at Atlantic in 1961 who even knew who Ruth Brown was! When Ruth finally left Atlantic, in 1961, she had a single release on the Maynor label, calling herself "Venus." WALKIN' AND TALKIN' was in the vein of Bobby Lewis' "Tossin' And Turnin'." The flip was HOOPA-LOOPA-DOOPA. NOTE: I found this listed on the Internet and it's really unsubstantiated. Ralph Basile, who owns the record, claims that neither side sounds anything like Ruth. 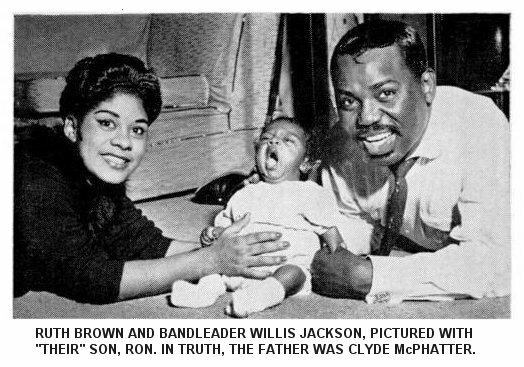 In 1962, with the help of Brook Benton, she switched over to the Philips label (a subsidiary of Mercury Records). There were two more chart appearances, both in 1962 and both on the Pop charts only. These were SHAKE A HAND (the old Faye Adams hit, which staggered up to #97), and a remake of MAMA (HE TREATS YOUR DAUGHTER MEAN), which had its parentheses reversed and just barely made the charts at #99. There were other labels after that: Noslen, Decca, Mainstream, Solid State, and Skye, but there were no more hits (although YESTERDAY on Skye received a Grammy nomination). Ruth slid from the top, working as a school bus driver and as a maid. But she was also a drug-abuse counselor in Long Island (New York) and continued to sing at local clubs. Then, almost broke (to the extent that she'd disconnected her phone), she hooked up with old friend Redd Foxx, who brought her to California for an appearance on his "Sanford And Son" TV show. He also got her a part, as Mahalia Jackson, in the musical play "Selma." Ruth started working clubs, which led to Las Vegas bookings. She also began working in the theater and TV, landing landed the role of Leona Wilson, the neighbor of McLean Stevenson's character on the 1979 TV show "Hello Larry." In late 1979, she did an overseas tour, returning to do further stage, TV and movie work. Ruth also appeared in the short-lived 1981 TV show, "Checking In," in which she played Betty, a floor supervisor at the St. Frederick Hotel. There was also the film "Hairspray," a Grammy for her "Blues On Broadway" LP, and a Tony Award for her work in the play "Black And Blue." In 1993, she was inducted into the Rock And Roll Hall Of Fame. 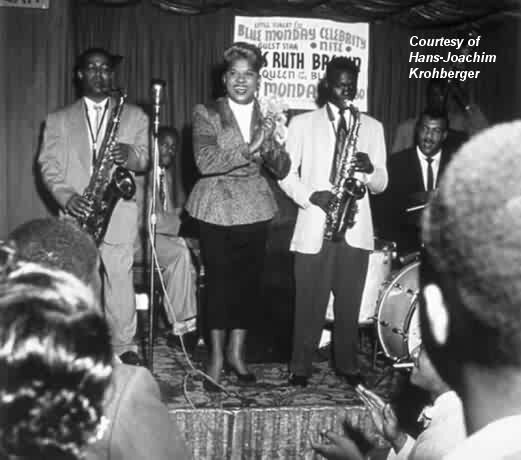 Ruth was also involved with the Rhythm And Blues Foundation, along with her old boss Ahmet Ertegun, Jerry Butler, Harvey Fuqua, Chuck Jackson, and Etta James. Ruth suffered a stroke in 2000, but came back to carry on with her career. Her talent seemed endless; her voice a still treat to listen to. However, another stroke, in early November 2006, put her on life support. Miss Rhythm passed away on November 17, 2006. 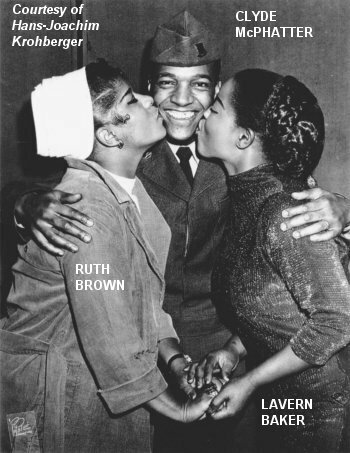 The world of music was lucky to have Ruth Brown; we will miss her.